In 2008, Marcus Sheridan was in charge of sales at River Pools and Spas, when the global financial crisis hit and as a result of the downturn in business, the company came to within days of bankruptcy and the business partners were faced with losing their homes, their employees losing their jobs. Marcus used the power of the Internet, to answer people’s questions on the River Pools blog. In Marcus’ words, they became the Wikipedia of fiberglass swimming pools. Marcus consistently and persistently addressed customer questions over the next few years, and today the River Pools and Spas website is the most trafficked swimming pool website in the world. It saved the company, it’s a very profitable strategy. The website gets about 600,000 visitors a month. As a result of this strategy, River Pools not only avoided bankruptcy, but is now highly successful expanding its operations throughout the USA. Marcus started the Sales Lion to share what he learned from the River Pools experience and help other businesses apply his philosophy of “They Ask, We Answer”. He has written a book with the same title and now travels the world speaking and training. His passion is helping others to reach their potential as teachers, as communicators and as speakers. So, what makes Marcus Sheridan successful? What drives him? What can we learn from his success, from his approach? Let’s begin by examining some values and beliefs I attribute to Marcus. What do we know about his vision as articulated for him and for his business? 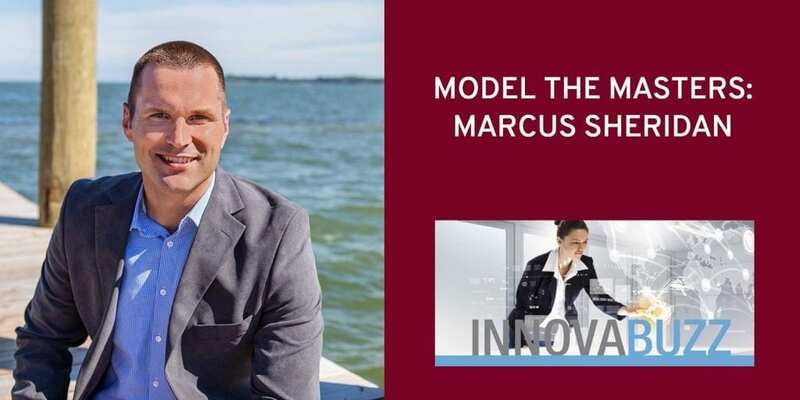 What stands out for me in all that Marcus does, is his obsession with gaining a deep understanding of his customers – so deep that he knows what they are thinking and what they are feeling. He cares deeply about his customers. Marcus is committed to be a “world class communicator”, a world class teacher, in providing all the information (content) that he does. He also is on a mission to help others develop these skills and apply them in their business. One of his special skills, is the ability to see in people, what others cannot or choose not to see, maybe even what people themselves choose not to see. In our podcast interview on Episode 44 of the InnovaBuzz podcast, Marcus emphasized that the goal of content marketing isn’t to show the world that you’re smart, the goal is engaging communication with your audience and education – teach better, listen better, then get the reward. As soon as I started at River Pools, I quickly realized I didn’t know much about the industry. Simply “knowing how to swim” wasn’t going to help me sell hot tubs, pool chemicals, and the like. So I did what I always do: I learned. I read. I studied. And I dug deep into the industry. Marcus Sheridan in “They Ask You Answer”. There are many people advising “Listen to the customer”. What sets Marcus apart is the depth with which he listens, seeks to understand – to see what the customer sees, hear what they hear, feel what they feel. There is a very powerful demonstration of Marcus applying this principle in a workshop that he did recently, where he spoke to a business owner that worked with abused children. Watch the video here – the relevant parts are between the 1:44 and 5:30 minute marks. “I want to feel what you feel!” is his message – very powerful! I fundamentally believe we all have a powerful teacher and communicator within each one of us. And for those persons willing to seek out this talent– the impact it can have on their life as well as the lives of those they come in contact with is tremendous. “Marcus, that thing you did with your pool company is so simple. I just can’t believe how simple it is!” Yes, it was simple. But simple is good. This way, anyone, including you, can apply that we did at River Pools and Spas to your business. You just have to truly care enough about the consumer to obsessively listen, teach, solve problems, and be honest in the process. Marcus is also a firm believer in “Getting Stuff Done” as he calls it – it’s the principle of taking massive imperfect action and not waiting until things are “right”. He’s not afraid of making mistakes along the way and learning as you go. In fact, learning, growth and challenge I would suggest, are core values of Marcus. He is sharing his journey on The Balance, which is part of his transparency and preparedness to be vulnerable. In this video series, he also often talks about his family, which is hugely important to Marcus, and how his success in business is allowing him to take time with and build deep and meaningful relationships with each member of his family. He often points out, that there is no separation between business and personal, and to be successful in one, you have to succeed in both. Let’s take a look at Marcus’ behaviour and what he does, that makes him successful. This is broken down into the Five Success Principles that I’ve spoken about before, particularly in Episode 66 of the InnovaBuzz podcast. Initially when Marcus started the “triage” at River Pools, his desired outcome was to avoid bankruptcy, save the business and turn it around. Now, his big picture outcome looks more like helping others reach their potential as teachers, communicators and speakers, so they can communicate at an elite level and make a difference in the world. He points out often, that people want to feel that you understand them, and by understanding them, by engaging them, you will have a lasting impact. Marcus certainly is an action taker – in his series The Balance, he seeks to visually tell the story of his day to day activities, in a way to lead and with the stated aim of “making mistakes so others can avoid them”. He is a prolific publisher, speaker, a passionate and engaging story teller and teacher – he takes action on all these fronts, not to show how much he knows, but to educate his audience and serve them. He is driven to serve. In our InnovaBuzz podcast interview with Marcus he talked about the ROI of content marketing, of knowing your numbers and knowing what works and what doesn’t. The idea of answering people’s questions may be quite simple; it’s important then to really understand what is having an impact, how that impact translates into an outcome that you are looking for and determining what’s working well and what needs improvement. Marcus repeately emphasises the need to measure everything in They Ask We Answer. Marcus is definitely a change agent – changing what they were doing at River Pools had dramatic effects. He isn’t afraid of making mistakes and treats them as feedback and learning opportunities to shape change that will improve what he does. Marcus has this in spades – he often talks about “being second is not an option”. His language reflects his focus on excellence – “World Class Communication”, “operate at an elite level”, “a great communicator in all of us”. To hear Marcus speak, to see him present, inspires excellence on all who watch or listen. Marcus has an excellent team of people working with him at the Sales Lion (and River Pools! ), and he partners with awesome people all around the world to help spread the message of elite communication, teaching, understanding your customer. He is very generous in sharing his knowledge, is clearly operating with an abundance mindset. What would Marcus Sheridan do? Develop a deep understanding of your customers, really feel what they feel and then answer all their questions before they ask or even think of them. Get stuff done – take action, learn as you go. Treat “mistakes” as feedback and evolve. In presentations, have a clear purpose for your audience and verbalize that purpose. Really know your audience and speak their language. The ability to really understand others requires you to ask questions. By asking the right questions at the right moment you’ll come to build a deep understanding and to engage your audience. Be real, be vulnerable and be in the moment – doing this well will enable you to build a deep connection with your audience and a deeper understanding.